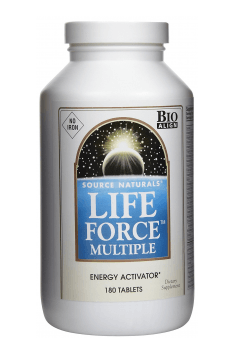 Life Force No Iron 180 tab. 2 to 4 tablets daily, with meals. Do not exceed suggested use. Due to the content of vitamins and other nutrients soluble both in water and fats, to create optimal absorption conditions of the substance, it is best to take the preparation at fixed times each day and during main meals. To achieve best benefits resulting from using the preparation, it is necessary to combine the supplementation with properly selected and balanced diet as well as physical activity. Supplement that can boost brain function. Improves circulation to the brain to sharpen memory. Supplement is a powerful blend of antioxidants, caffeine and digestive enzymes to help you meet your diet goals. Capsules with the extract of ginseng and vitamins. They strengthen the immune system and anabolism, and improve mood. A dietary supplement based on an organic hemp oil that contains bioactive cannabinoids. Chromium polynicotinate, is an organic chemical compound made from the combination of trivalent chromium with vitamin PP (niacin, vitamin B3) included in the glucose tolerance factor (GTF), synthesized in the liver and increasing functional properties of insulin. Polynicotinate chromium has stabilizing effect on blood pressure. It has thermogenic potential, allowing for decreased appetite (especially for sweets), reduces the risk of developing diabetes, keeps the body in good physical condition. In the dietary supplementation, polynicotinate chromium is used in programs to reduce body fat and improve body composition, it is in the form of mono-preparation supplement and is a component of weight loss preparations (thermogenic), and vitamin and mineralizing supplements, available at www.muscle-zone.pl. Grape seed extract is a valuable source of active ingredients: flavonoids, fatty acids, proanthocyanidins and vitamin E, an antioxidant, binding free radicals, anti-inflammatory and anti-aggregating. It is a component of a pro-health supplements enhancing preventive treatment of the circulatory system diseases. Available in the form of mono-preparation supplements or as a component of nutritional supplements (creatine stacks and nitrogen boosters), vitamin, herbal detoxificating. Dosage: 50-100 mg per day. Bioperine - a black pepper extract, which is a source of plant alkaloid – piperine, enhancing secretion of digestive juices, affecting the increase of the availability of food (and other chemicals) and regulating the digestive tract. Through the access to food and chemicals, it indirectly influences the development of muscle tissue and increases the exercise capacity (psychophysical). There has been a positive effect on the immune system and the intensification of the lipolysis processes observed. Available in the form of mono-preparations and as a component of supplements and nutrients. Dosage: 5-10 mg per day. Astaxanthin - currently it is considered the strongest antioxidant (according to the research, it is much stronger than vitamin C or beta-carotene), which has a detoxicating effect on the organism. This substance is therefore incredibly important in the process of elimination of free radicals and detoxification. As a compound from the group of carotenoids, it conditions the process of proper vision, however, it is not used as a building block of retinol (derivative of vitamin A) and it may fulfill its functions in the whole organism, where it is also transported. It was proven that astaxanthin helps to inhibit the creation of pathological lesions in the eye retina, therefore introducing it do a diet may even cause vision improvement. Astaxanthin also decreases blood pressure, thanks to which the risk of developing circulatory system disorders is lower. Additionally, it demonstrates protective effect on neurons, which may be important in the future in the Parkinson’s or Alzheimer’s disease. This carotenoid is also friendly to diabetics, as thanks to antioxidant properties it inhibits oxidation of LDL cholesterol and makes pancreatic cells more sensitive to insulin.